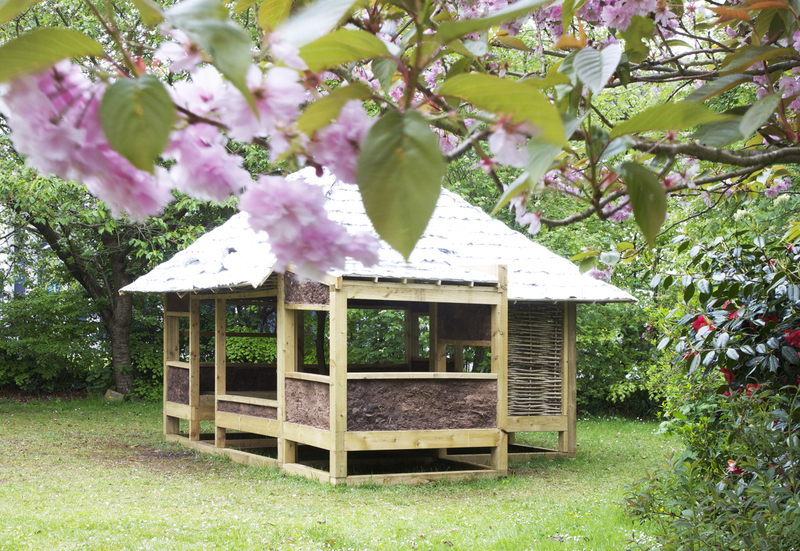 Umbrella Teahouse was built by first and second year architecture students during a three week intensive studio programme in the Temple of Peace Gardens at the University. The design of the Teahouse is based on the 16th Century Japanese teahouse Kasa- Tei in Kyoto, part of the Zen Garden in Kodaiji Temple. Students began the studio by collecting materials from local sources. A local farm provided soil, straw and dung for wattle and daub. With permission of Forestry Commission Wales students coppiced hazel and collected air dried logs in a forest, 7.5 miles north of Cardiff. The timber frame was constructed using softwood donated by Western Timber Association. A lattice of small roofing battens forms the umbrella roof structure, wrapped with hand folded aluminum tinfoil sheets. 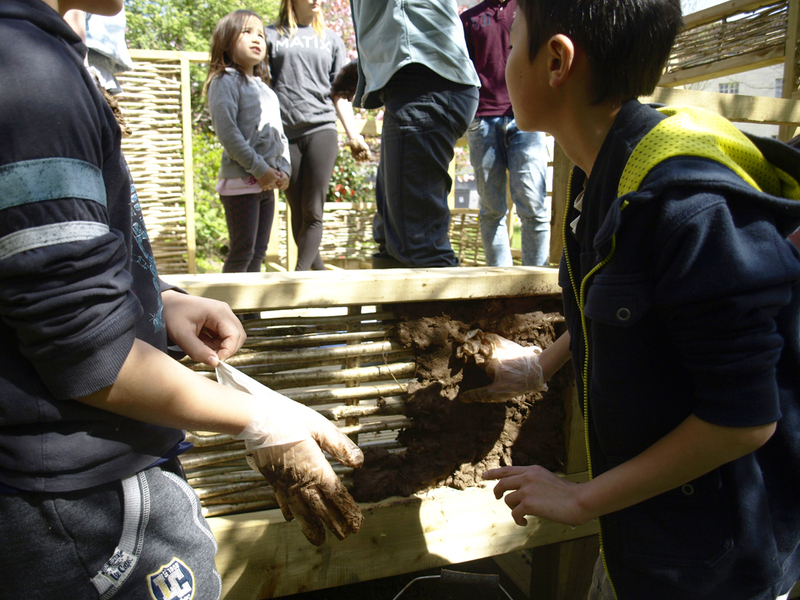 During the construction students engaged with the local Japanese community in Cardiff, by means of a one-day daub workshop. 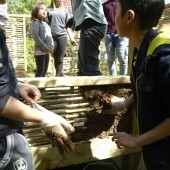 Volunteer children and adults joined students in paddling raw materials and applying the daub mixture to the walls. The original Kasa-Tei was first built in Fushimi Castle along Yodogawa River in Kyoto, then moved to its current location, adapting its orientation and arrangement in relation to the garden setting. 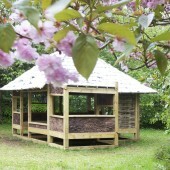 Similarly the Umbrella Teahouse relocated to Cardiff Central Library, coinciding with the Cardiff Japan Day event. It will eventually be relocated to a park garden setting within the city, where it will hopefully become a permanent structure to be enjoyed by visitors and residents of Cardiff. Research Question: Kasa-Tei is thought to be designed by Sen No Ryikyu, the Japanese tea master who established the Wabi-Cha style aesthetic movement through his tea ceremonies under the rein of Shogun Tokugawa during the 16th Century. Wabi-Cha calls for a reduced, simple and humble aesthetic. 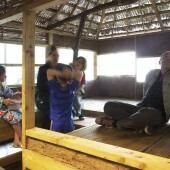 Wabi-Cha references Sou-An, a small ‘shack made out of weed’ found outside the city, and Minka, vernacular farmhouses, with mud walls and thatched roofs. In the original Kasa-Tei, readily available local materials were used, such as bamboo and bent logs, and mixed in a playful way. 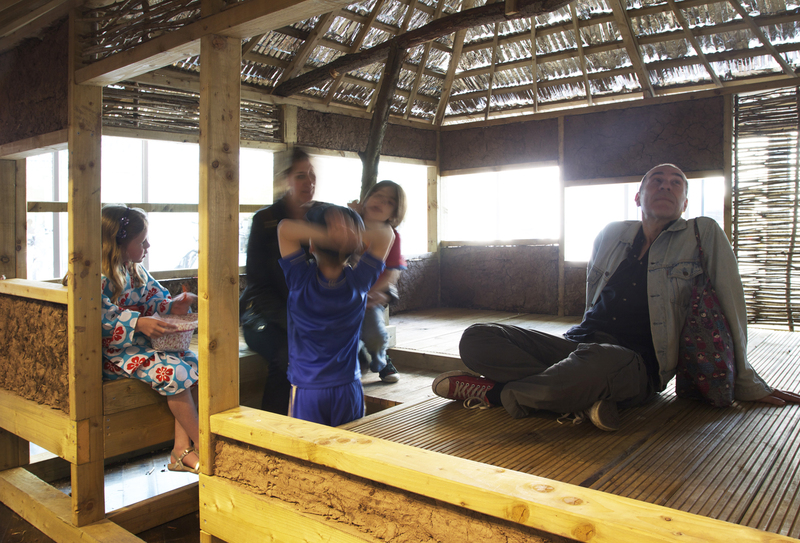 The studio was interested in exploring these ideas through transforming the original teahouse into something new, by mixing up traditional Japanese and Welsh building techniques with contemporary standardised building components and domestic household materials.